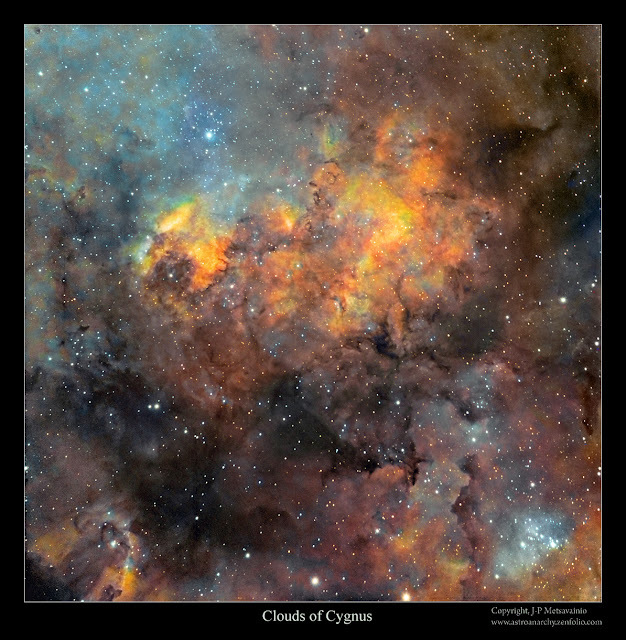 I have shot the constellation Cygnus for many years with different instruments. Due to that, I'm able to build mosaic images from my overlapping material. This time I made a four panel mosaic showing remains of the two exploded stars in Western Cygnus. Bluish hues at left part of the panoramic image are from supernova remnant W63. At most right lays the planetary nebula PM 1-320. 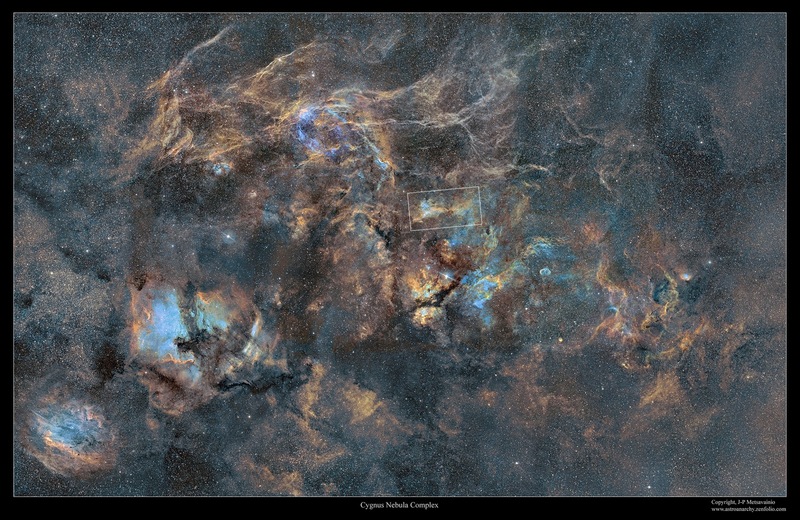 This four panel panoramic mosaic has a total exposure time of about 35 hours. 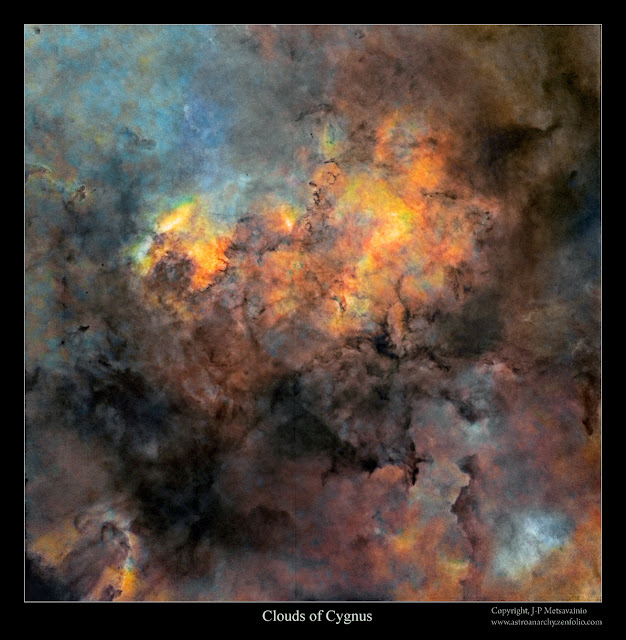 Image is in mapped colours, from the emission of ionized elements, R=Sulphur, G=Hydrogen and B=Oxygen. 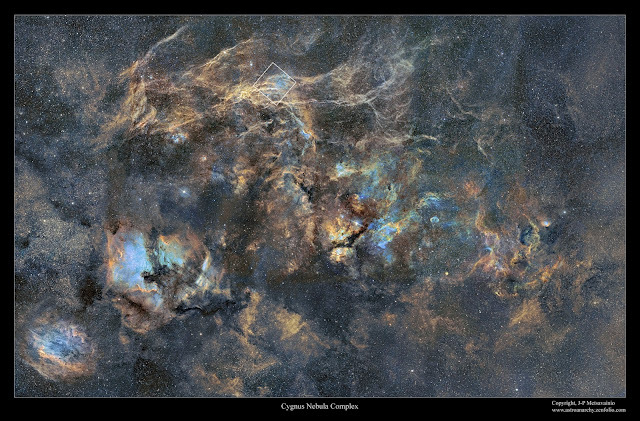 This mosaic image of four individual panels covers about four degrees of sky vertically. A new photo from last night. 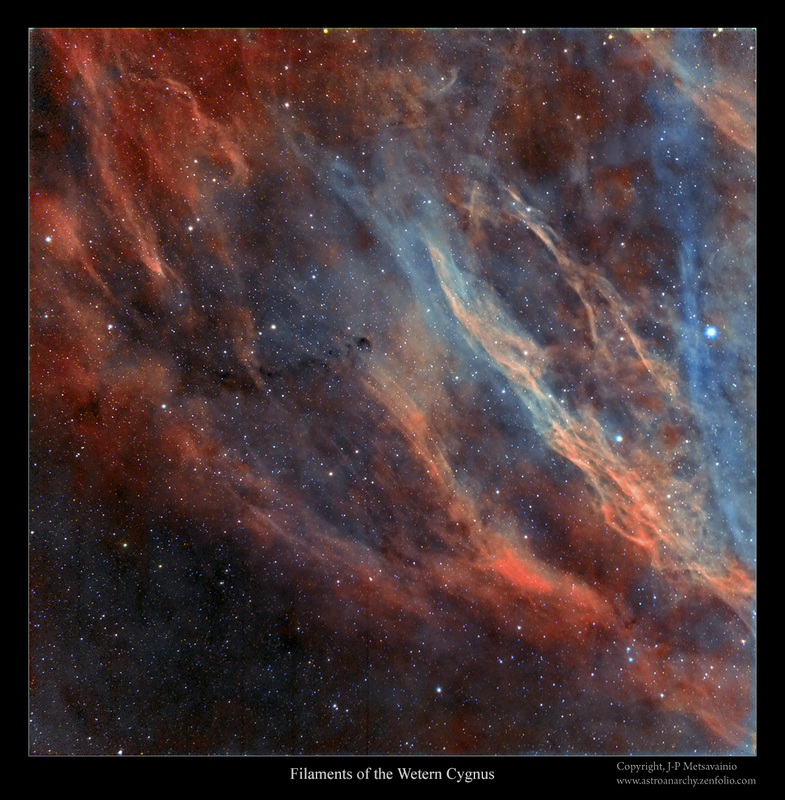 Detail shot from the central area of the Cygnus nebula complex. 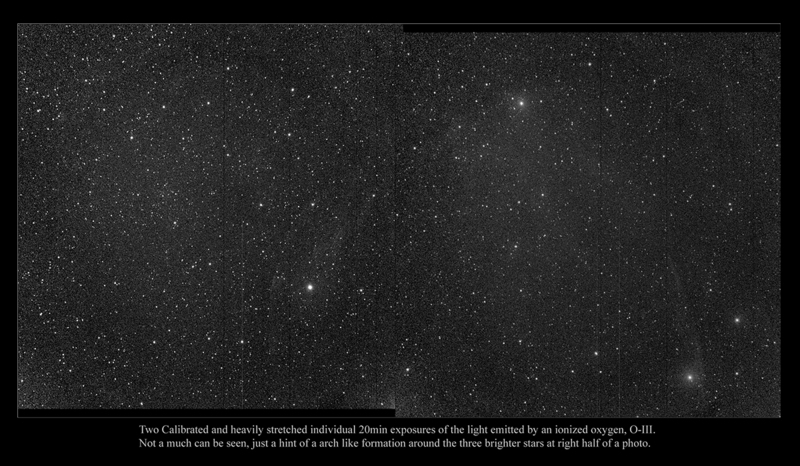 The details of gas formation are standing out better in this starless version. 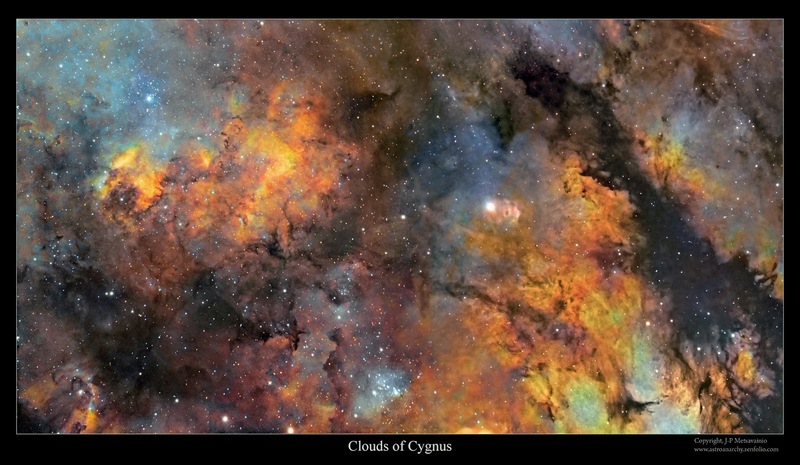 My older photo of central Cygnus was overlapping with the new image, so I was able to build a two frame panoramic mosaic. The area of two panel mosaic is marked as a white rectangle. O-III, 3 x 1200 s, binned 4x4 = 1 h.
My latest photo show a busy area in Cygnus, there are not too many photos out of this area alone. 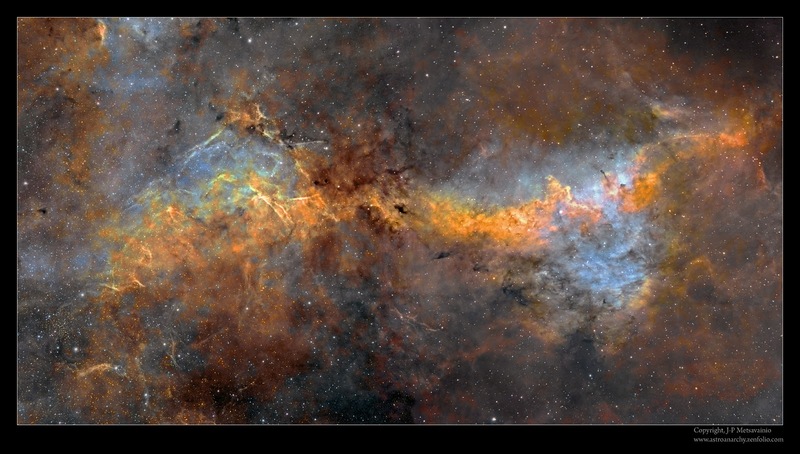 My large mosaic image of cygnus shows this object group as pow tie shaped formation. 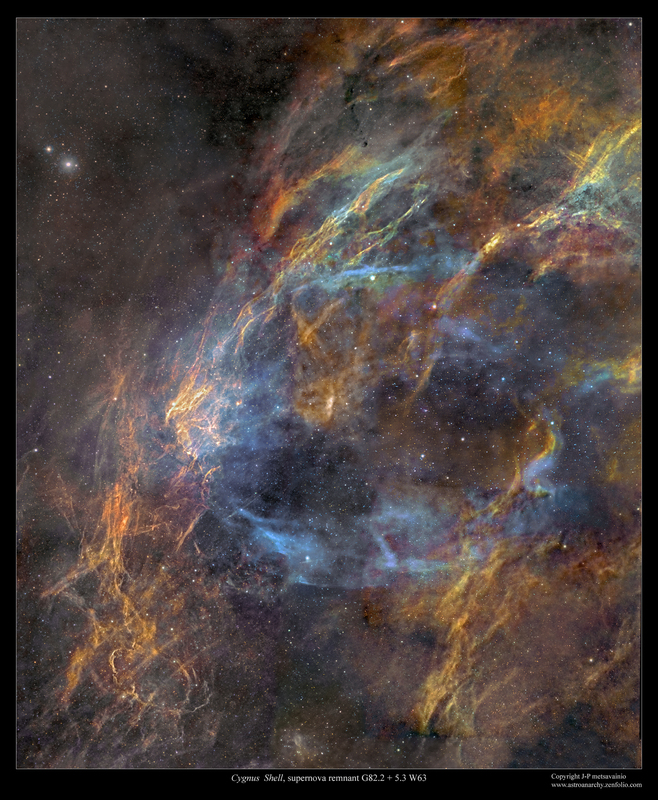 This two panel mosaic image is in mapped colours, from the emission of ionized elements, R=Sulphur, G=Hydrogen and B=Oxygen. I have now finalized my imaging project with this not so well known, supernova remnant, W63, in Western part of the constellation Cygnus. 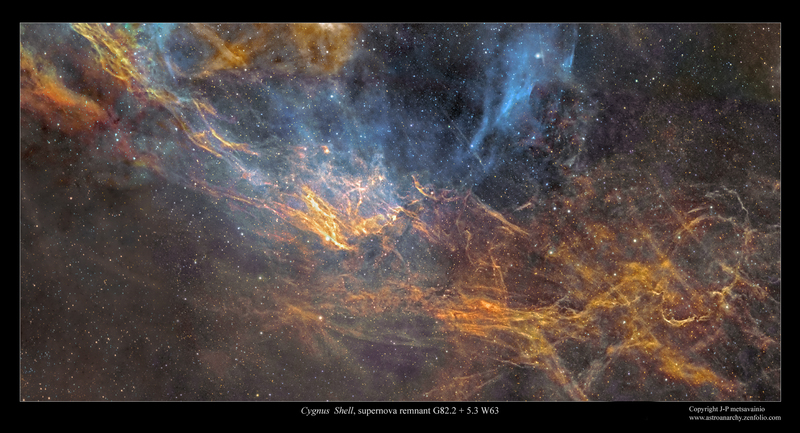 This time I made a version in visual colors from narrowband channels. 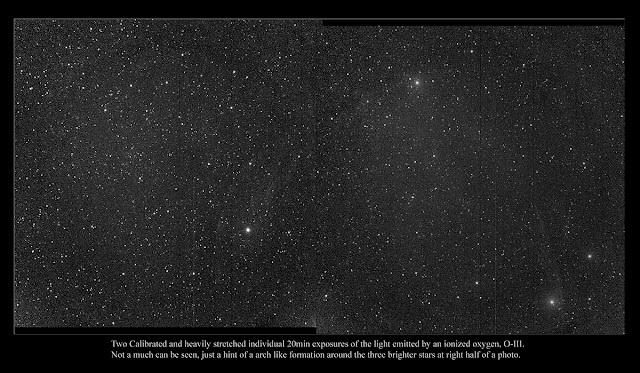 Red light from an ionized hydrogen, H-alpha, is dominating the scene. 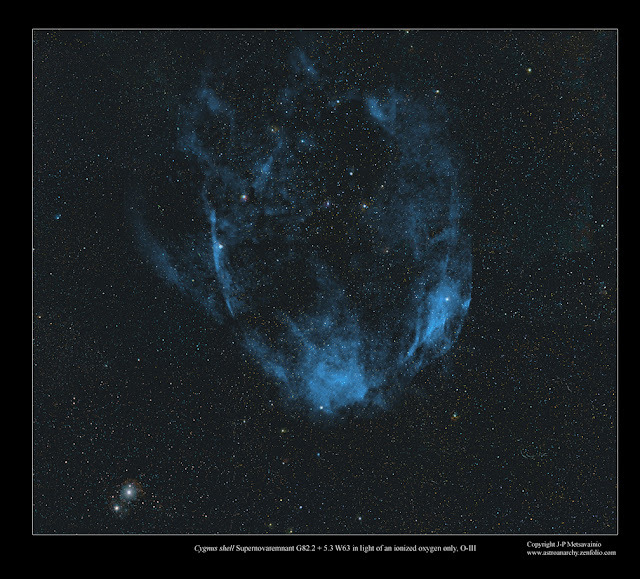 The actual supernova remnant glows in blueish light emitted by an ionized oxygen, O-III. The mapped color version can be seen in my previous blog post. 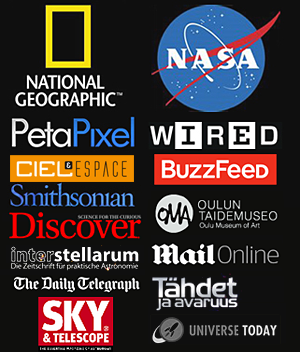 Individual panels are shot between years 2015 and 2018. O-III and some missed data are shot at this ongoing Autumn season. Please, click for a large photo it's worth it! A large 18-panel mosaic image of the Cygnus Nebula Complex shows 22 x 14 degrees of sky. W63 (G82.2+5,3) is a large supernova remnant that can be observed in the north region of Cygnus at distance of about 5200 light years. It spans around 100 arcminutes and its filaments are expanding at speed ranging from 35 to 70 km/s. 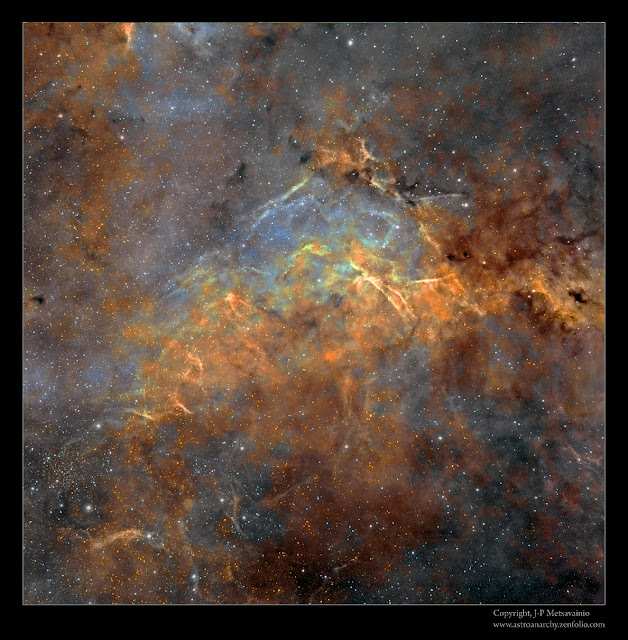 In 2004 the existence in this supernova remnant of an X-ray pulsar with 36 second period was reported. I have planned to shoot this very difficult target for many years. At this Autumn season I had a possibility to finalized my imaging project with this, not so well known, supernova remnant W63 in Western part of the constellation Cygnus. Image is in mapped colours, from the emission of ionized elements, R=Sulphur, G=Hydrogen and B=Oxygen. This mosaic image of twelve individual panels covers about four degrees of sky vertically. 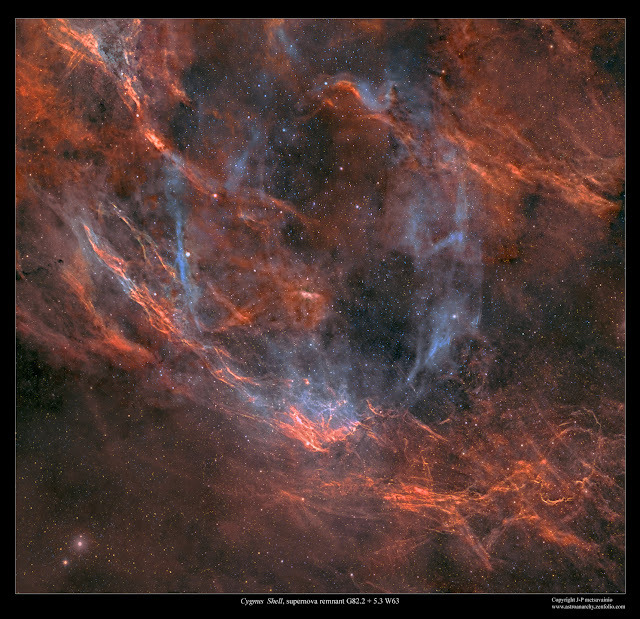 The Cygnus Shell, the supernova remnant W63, can be seen as a blueish ring at upper center. An older 18-panel mosaic od Cygnus Nebula Complex back from 2012. 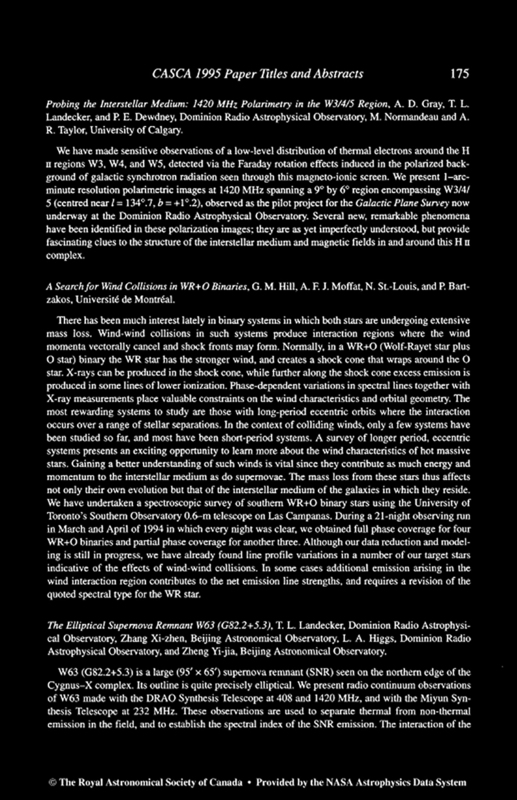 Total exposure time around 150h. QHY9 astrocam, Canon AF 200mm f1.8 lens and Baader narrowband filter set. This animation shows the shell of an ionized oxygen without H-a and S-II channels. 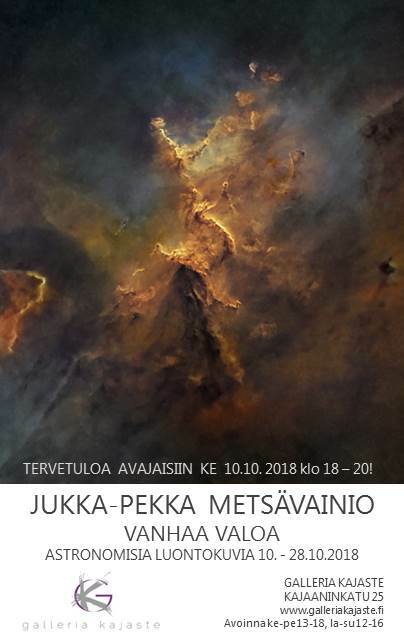 A new exhibition in Oulu, Finland! Lots of my new photos as a large size Diasec prints.